Apostolos Leventopoulos is a guitarist, currently living in Athens, Greece. He started his musical education at the age of nine, studying piano for about seven years. He later switched on guitar, studying at Synxrono Odeio and Agostini Music School in Thessaloniki. 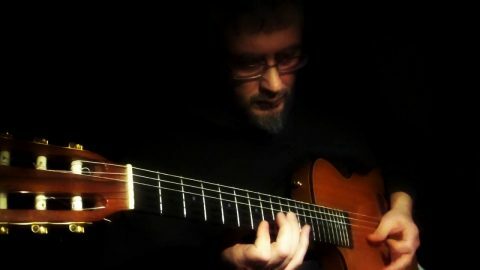 He won a scholarship to attend Berklee College of Music, where he studied guitar with John Thomas, Ritchie Hart, John Pezanelli, Mick Goodrick, Jon Damian, Garrison Fewell, improvisation with Ed Tomassi, George Garzone, Tiger Okoshi, Jeff Galindo, theory and composition with Steve Rochinski, Ken Pullig, arranging with Ben Elkins, Scott Free, and others. He graduated in 2001 (Bachelor in Jazz Performance – Dean’s List), and participated in the group that represented Berklee College at Berklee International Network that same year. He has attended many seminars given by players like Peter Bernstein, Hiram Bullock, Alan Holdsworth, Pat Martino, Pat Metheny, Kurt Rosenwinkel, John Scofield, Mark Turner, Jeff ”Tain” Watts and others. He also has a classical guitar degree. He has taught guitar and music theory at Giorgos Fakanas music conservatory (2002-2007), Elefthero Odeio conservatory (2002-2008), and a multitude of private lessons. Since 2011 he teaches at Philippos Nakas conservatory, and keeps playing with various bands and projects as a session musician.